Besides being super pretty for the ‘gram, poké bowls are healthy, satisfying and delicious, layering lots of diverse ingredients together. As our obsession with poké continues to grow, the pioneers of the culture in Singapore continue to feed it with tasty new takes on the Hawaiian concept. Aloha Poké, the first poké joint in Singapore since 2015, celebrates their third anniversary with a refreshed menu! Much of the beauty of poké is the customisation, filling your bowl with the toppings you want. 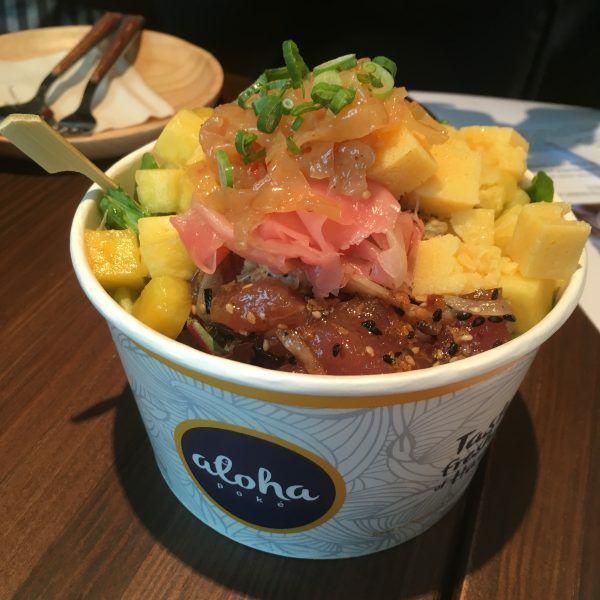 Now, you have lots more amazing toppings to choose from at Aloha Poké. The new premium add-ons ($1.50 each) really shake up the flavours of a regular poké bowl. There’s crunchy jellyfish, smoky sweet roasted bell peppers, tangy sundried tomatoes, crispy and fragrant Japanese garlic chips, and Ikura (salmon roe; $3.50). Adding more vibrant colours to your bowl are the new standard add-ons ($1 each) – two types of Japanese seaweed, the seasoned Chuka Wakame and the toasted Nori seaweed; and sweet and sour pickled ginger. Scoop your favourite ones up on some salmon or tuna, and you’ve got yourself a refreshing meal! A simple poké bowl can be so fulfilling as a meal because of the carb bases. Rice is the main base layer of a bowl, and you can get both white and brown rice at Aloha Poké. But if you’re reducing your carb intake, you now have the choice of cauliflower rice! We love Aloha Poké’s new cauliflower rice! It’s so soft and fluffy, slightly spiced to excite your tastebuds. It also has a nice chewy texture that goes well with the crunchier new toppings. The poké joint also has other palate needs covered. For those who are not so big on raw food, Aloha Poké introduces two new cooked pokés, including a vegetarian bowl! The cooked nutty sesame tofu and the king mushrooms (both at $4.50 per scoop) are wonderfully seasoned, with Japanese sesame dressing for the tofu, and sweet garlicky balsamic vinegar for the mushrooms. You can have them together with that amazing spiced cauliflower rice in the new vegetarian signature bowl, Green Giant ($17.90). 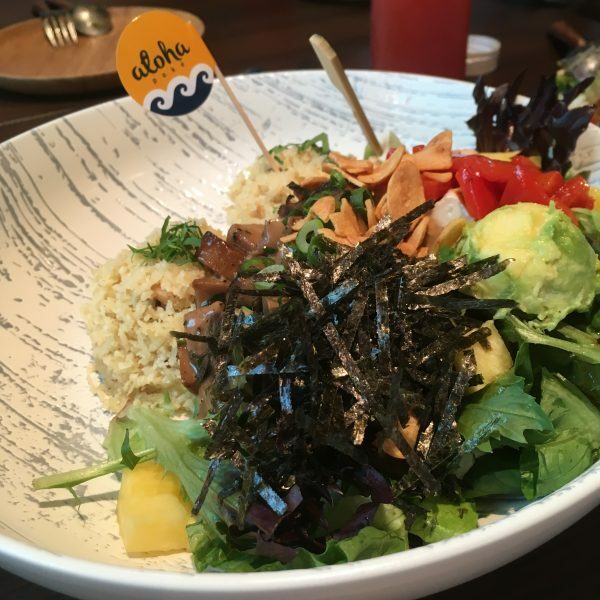 Vegans can also have a great meal at Aloha Poké! As mentioned, one thing we love about poké is the customisation, so vegans can totally mix and match the meatless and non-dairy toppings available. Even better, you can make a special request for a vegan bowl, though, of course, the chefs would need extra time to prepare it. For our resident vegan, the chefs kindly prepared a vegan bowl, featuring the cauliflower rice, the tofu with vinegary dressing instead of the sesame one (which used dairy), avocado, edamame, pineapples, and more. Needless to say, she loved it! 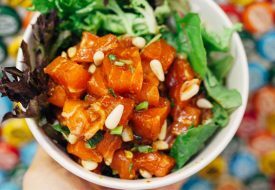 Aloha Poké caters to your cooked meaty cravings too. 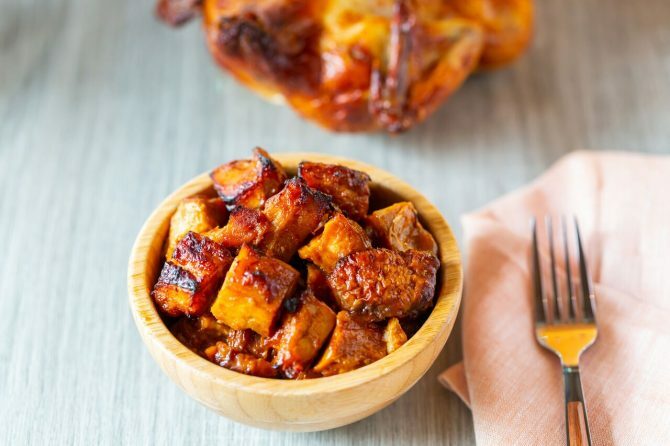 The chunky cubes cooked Habanero Chicken ($4.50 per scoop) is a mouth-watering new addition, sautéed with a garlicky, spicy Hawaiian Habanero sauce. It pairs great with the greens and rice. 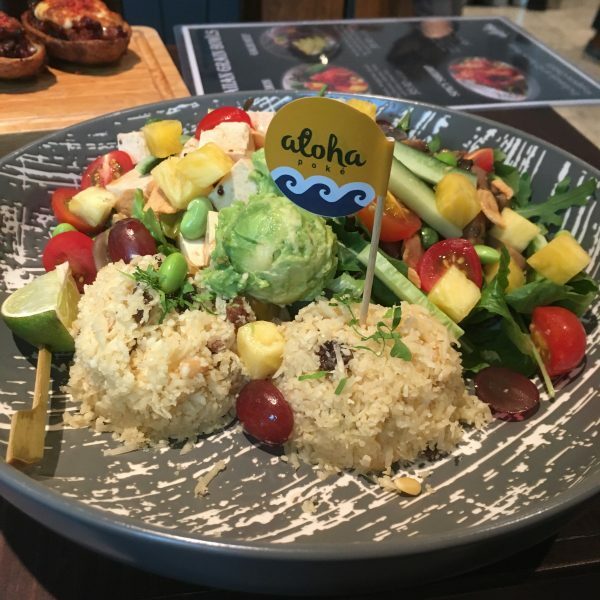 As part of their third anniversary upgrades, Aloha Poké has refreshed not only their menu, but also their look. 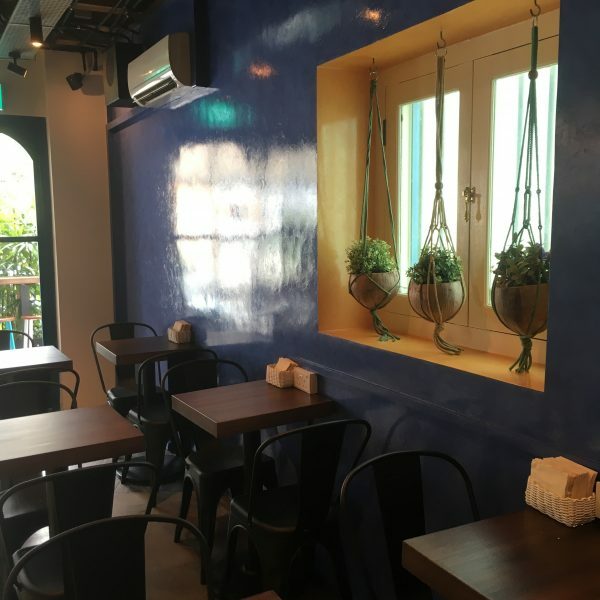 The outlet that began it all at Amoy Street had a little makeover in tribute to its Hawaiian culinary roots. Against the calming ocean blue walls are mock surfboards and Smiley Tiki masks. They add a vibrant and relaxing ambiance, giving their diners a respite from the hectic CBD office life. After the work day is over and done, you can really loosen your tie and let your hair down at Aloha Poké. 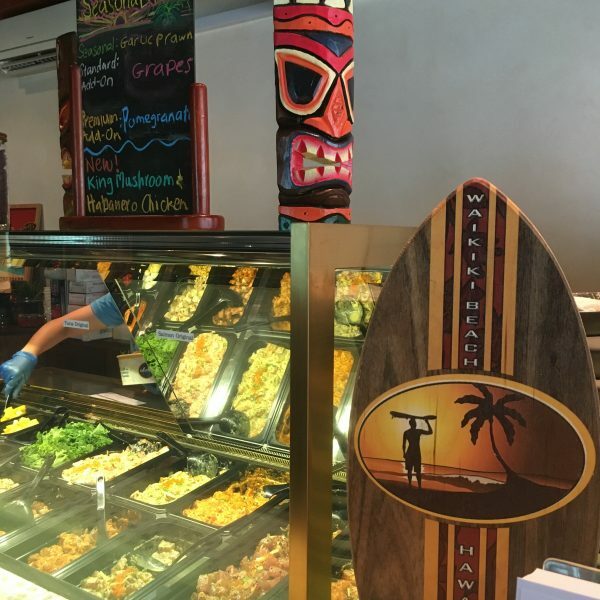 The Amoy Street outlet now features a Hawaiian Tiki Bar! Open from the evening till late, the bar serves up craft beers by Kona Brewing Co. ($10) and seven different yummy bar snacks. 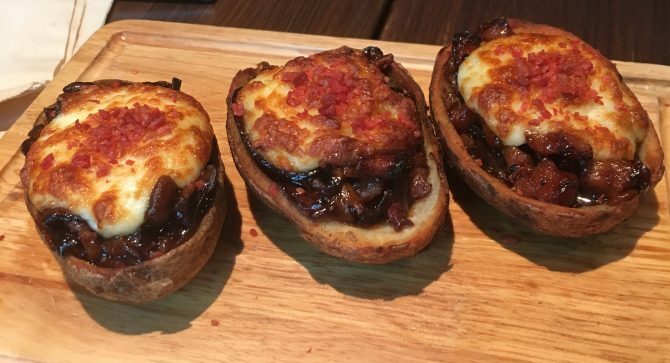 They include this super tantalising Stuffed Potato Skins (three for $12). The baked potato halves are stuffed with chicken and king oyster mushrooms, sauteed in a sweet homemade teriyaki glaze, and covered in the melty goodness of mozzarella cheese. As you can see, they look so heavenly, so much so that a guy from the next table came over to ask us what the dish was! The other bar bites are just as pleasing in looks and taste. 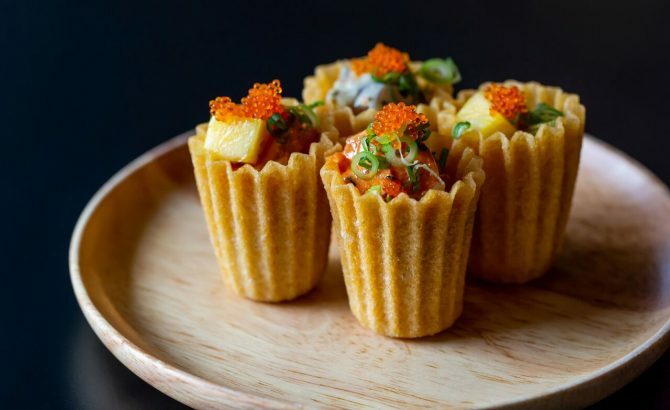 If you’re in a hurry, the Poké Pie Tee (four for $9.00) are cute little bite-sized pokés in pastry cups, inspired by the Peranakan dish Kueh Pie Tee of course! So when the weight of work is getting too heavy, head over to Aloha Poké and let the peaceful decor and refreshing new treats lighten up your day! Previous PostThe SK-II Future X Smart Store Finally Arrived To Singapore—Outside Mandarin Gallery! Next PostWinter Adventure Park ICE MAGIC Is Coming To Singapore February 2019!